I have mentioned this before but it bears repeating that every once in a while I get hop fatigued from all the big, brash IPA’s here on the West Coast, not to mention the generous hop profile of almost every other beer style out this way. When this ennui sets in I want something with just a touch of hoppy bitterness, or dare I say subtlety, while still maintaining the light bodied crispness of the pale ale family. Now before you start throwing holy water on me and shoving crucifixes in my face I absolutely have a place in my beer stockpile for the hop bombs but this time out I want to delve into the diversity of the bitter family. Pale Ales and Bitters comprise one of those beer families where the style names tend to be used freely and interchangeably. According to Mosher in Tasting Beer, the term Pale Ale typically applies to bottled beers on the strong end of the range while Bitter generally refers to drafts of all strengths. Add into the mix the qualifiers “Ordinary”, “Best”, “Special” and “Extra Special Bitter or ESB” and we are not really that much further ahead in our understanding. For quite some time I simply thought IPA=USA and ESB=UK but this is a bit too simplistic. At the heart of the style lay the common elements of lightly kilned pale ale malt, which imparts that subtle nutty flavour and just a bit of toastiness, and hops in varying quantities to add the requisite bitterness. 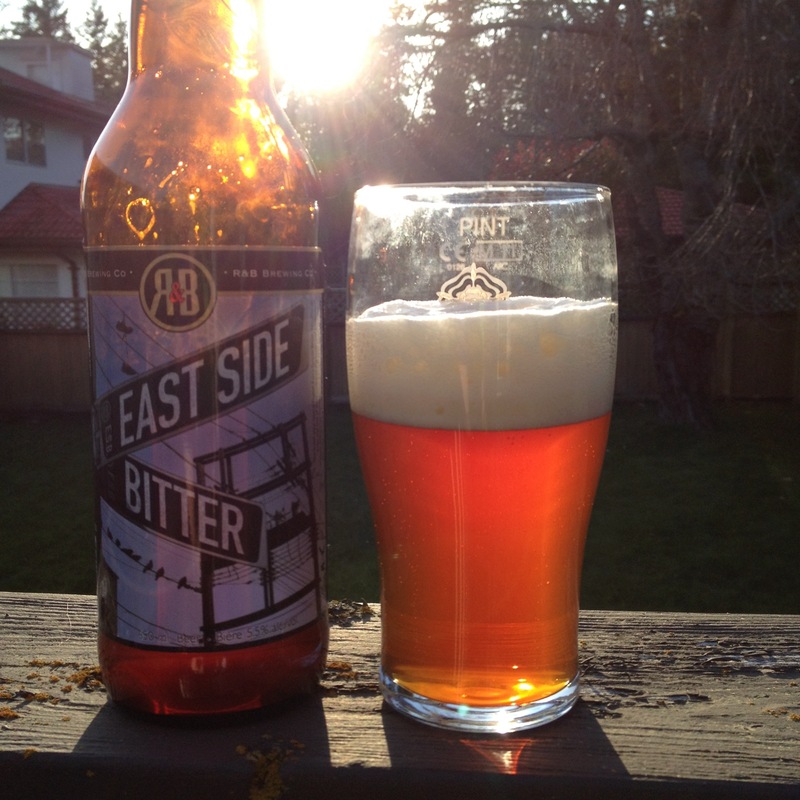 India Pale Ales comprise the far end of the hop spectrum while the English Pale Ales and Bitters offer a more balanced profile but tend to blur the style boundaries. 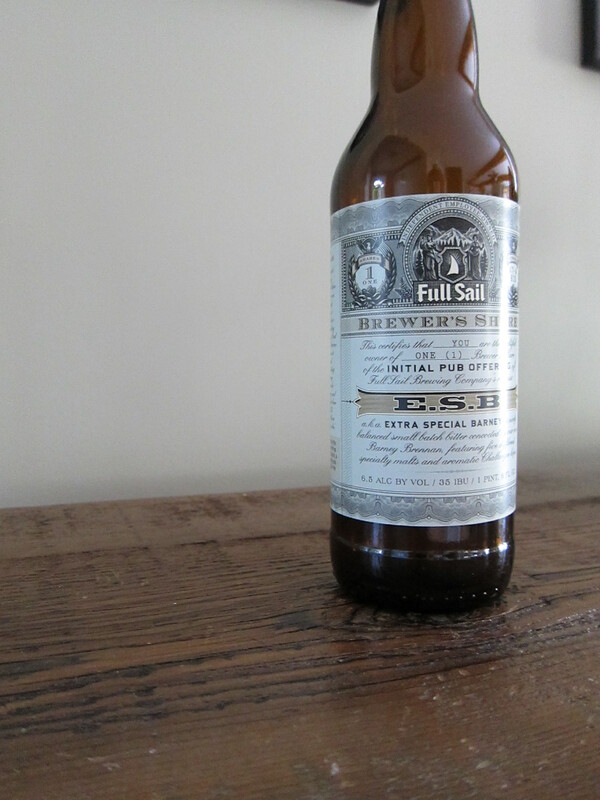 Turning back to Mosher, he suggests, English Pales Ales tend to be more substantial beers than bitters, can be brewed with all-malt versions and must display the English hop character (especially important to the aroma). I guess this leaves the term Bitter to denote everything else. Standard/Ordinary Bitter – Low gravity, low alcohol levels and low carbonation make this an easy-drinking beer. Some examples can be more malt balanced, but this should not override the overall bitter impression. Drinkability is a critical component of the style; emphasis is still on the bittering hop addition as opposed to the aggressive middle and late hopping seen in American ales. Special/Best/Premium Bitter – A flavorful, yet refreshing, session beer. Some examples can be more malt balanced, but this should not override the overall bitter impression. Drinkability is a critical component of the style; emphasis is still on the bittering hop addition as opposed to the aggressive middle and late hopping seen in American ales. Extra Special/Strong Bitter – An average-strength to moderately-strong English ale. The balance may be fairly even between malt and hops to somewhat bitter. Drinkability is a critical component of the style; emphasis is still on the bittering hop addition as opposed to the aggressive middle and late hopping seen in American ales. A rather broad style that allows for considerable interpretation by the brewer. Got that? Me neither, so let me try to put this into terms that speak to what really matters to beer geeks …what do I put in my fridge? Before I move onto my reviews can I just say kudos to both brewers for their clever use of acronyms, as a geek in general (not just a beer geek) I appreciate the word play. I have been dutifully continuing with my plan to become a craft beer locavore by sampling another three beers brewed right here in beautiful British Columbia – I also put in some time at St. Augustine’s purely for research’s sake. In terms of BC beer selection this time out I bought my brews from the provincial liquor store so I am not skewing my education by only shopping at the Central City Liquor Store. So what’s on the agenda this time around? Deckhand Belgian Saison from Lighthouse Brewing Company in Victoria, Dark Star Oatmeal Stout by R&B Brewing Company from Vancouver and French Oaked Stiff Stout from Dead Frog Brewing in Aldergrove. 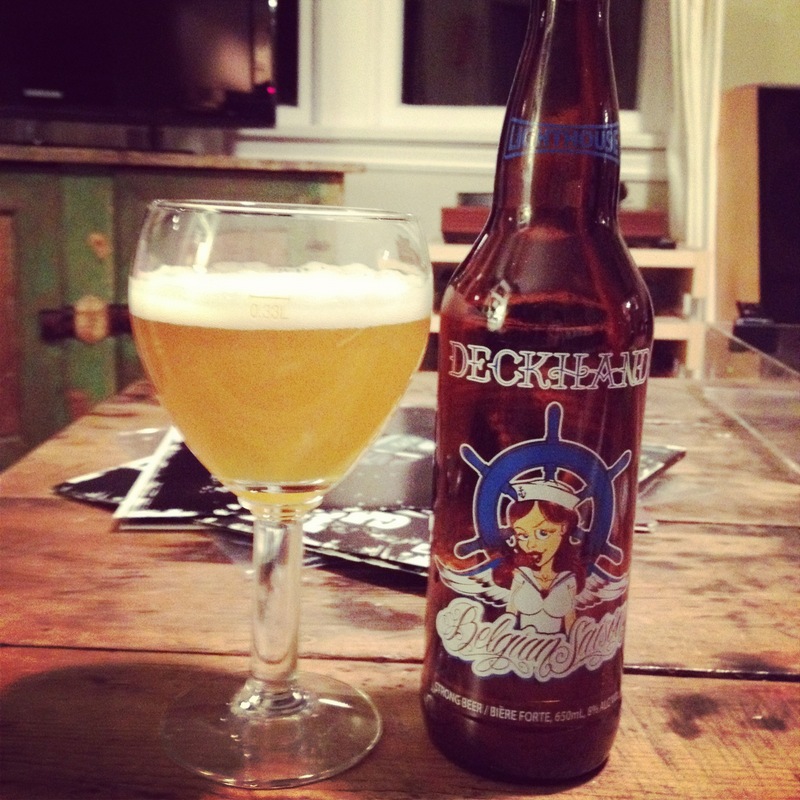 Deckhand Belgian Saison: Pours straw gold with a ton of white head that quickly dissipates. Beer label is a neat idea, Sailor Jerry tattoo style designed by a local artist, but the overall aesthetics are not my favourite. Requisite amount of cloudiness for the style. 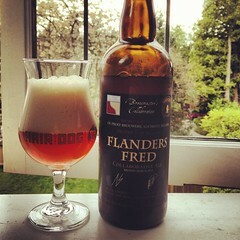 Strong sour yeast nose with an almost chalky mouthfeel on the first sip. Gives way to competing notes of bitter and pepper that generally work well in a saison but tend to overpower this beer since it is quite light bodied. All the flavour seems to some at you right away but no element lingers for an aftertaste. Mellowed out when it warmed easing up the sharp tastes. Dark Star Oatmeal Stout: Pours a lovely dark chestnut/black, clear with a minimal amount of caramel coloured head. An okay bottle graphic nothing memorable. Very astringent on the nose, almost rubbing alcohol like, but thankfully this disperses as the beer sits out. Nose evolves into roasted coffee notes. Very light in body for a stout and not a lot of flavour in the mouthfeel besides coffee. Reminds me Mill St. Coffee Porter. 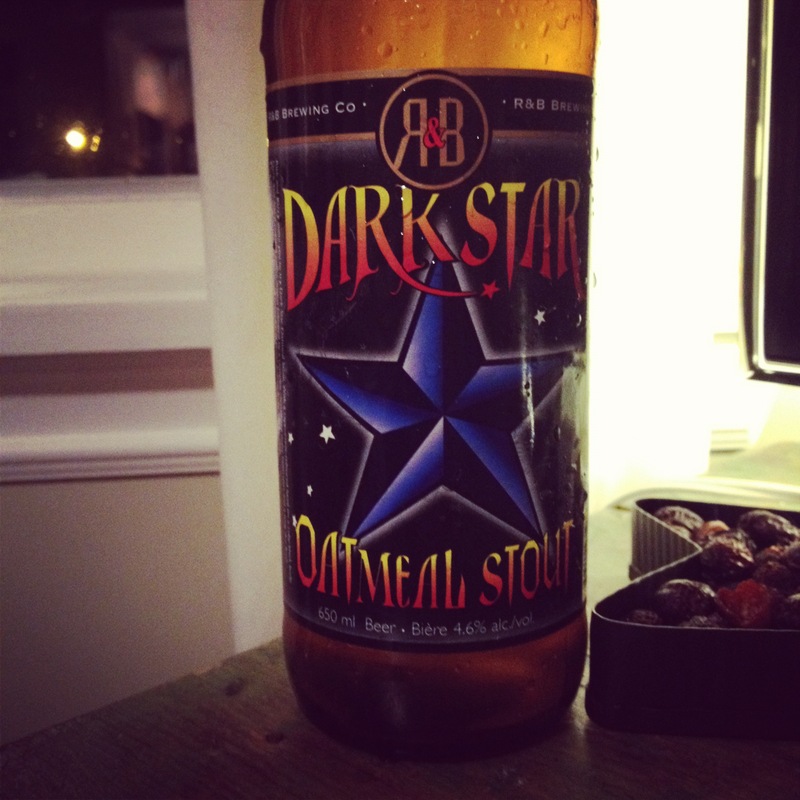 Much like the first beer, Dark Star improves with a bit of warming giving the beer a bit of depth. French Oaked Stiff Stout: Pours deepest black stout, clear with a rapidly disappearing head. Not a fan of the Dead Frog labels but to each their own. This oaked beer is part of their “Beer Master Series”. The Stiff Stout has an oaky, sweet nose and a sticky mouthfeel. A bit more depth in the body compared to the Dark Star. Complex flavours that warms well. There is nice sweet malt on the finish. 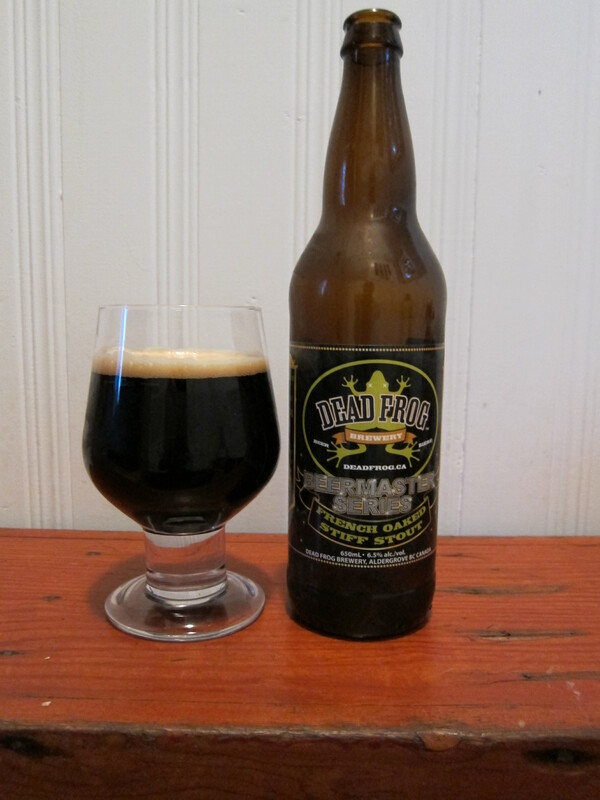 The Verdict – I give this round to Dead Frog’s French Oaked Stiff Stout.